A 24-year-old man was killed last Monday night from injuries suffered in a motorcycle accident on Peabody Road in Fairfield (Sacramento County) according to Sacramento County officials. According to authorities, the young man was racing his motorcycle against a silver Acura around midnight when he lost control of his bike and crashed into a signpost. The Acura fled the scene. The rider was flown by helicopter to UC Davis Medical Center, but unfortunately succumbed to his injuries. Authorities are still searching for the driver of the Acura. While our prayers go out to this rider and his family, this is the kind of irresponsible behavior that, sadly, leads to many injuries and fatalities and gives motorcyclists (the vast majority of whom are responsible riders) a bad name. If you want to race your bike, by all means do it — at the track. Racing along back-country roads in the middle of the night is a recipe for disaster. 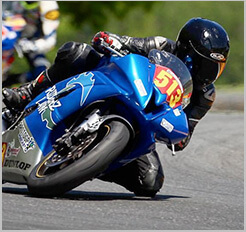 Although we are motorcycle accident lawyers, first and foremost, we are motorcyclists ourselves. We see enough tragedies from motorcycle accidents caused by knuckle-head drivers. This accident was entirely preventable.